Those surface-to-air missile batteries that are being installed for the London Olympics must have been invented by Stark Industries. Each high-speed missile houses a trio of smaller projectiles — like a yroika doll of fiery, explosive death. They're officially known as the Starstreak HVM (High Velocity Missile) system and are built by Belfast-based Thales Air Defense. These short-range missiles are laser-guided, which makes them impervious to infrared jamming and anti-radar missiles, and they're designed for close air defence against fixed-wing fighters and helicopters. 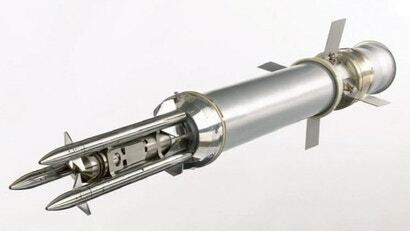 Every Starstreak is packaged in an individual firing tube that is loaded into an aiming unit. The operator employs a stabilised sight to track his target. Once the operator looses a Starstreak and it's safely clear of the firing tube, a second stage rocket kicks in and accelerates it to Mach 3.5. When the second stage is exhausted, the Starstreak unleashes a trio of 15-inch long, 900g, tungsten alloy mini-missiles, each armed with 450g of high explosive and a delayed action impact fuse. That ensures the mini-missile penetrates its target before exploding. These tiny death strikes are also guided by the operator, who uses a pair of targeting lasers to generate a 2D matrix to steer them.